Barnyardgrass is a summer annual grass with erect, clump-forming stems. Throughout most of the United States, Canada, and Mexico. Reproduction is by seeds which germinate in early spring to midsummer. Seeds are shiny, oval, brownish, with longitudinal ridges, and 3-4 mm long. The first leaf blade is linear and opens parallel to the ground. Leaves are rolled in the bud, lack auricles and have no ligule. Blades are 7-14 cm long and 3-5 mm wide, smooth on both surfaces, with rough margins. Sheaths are somewhat compressed/flattened, tinted maroon or purple toward the base and usually smooth. The collar is green and smooth. In corn, barnyardgrass may be coarse, sprawling, and purple tinged; sometimes even prostrate and fan-shaped; or it may grow more upright like fall panicum. Leaves are similar to those of seedlings, and ligules are absent. Blades are 10-20 cm long and 5-20 mm wide, lack hairs and are smooth to somewhat rough on both surfaces. The midvein is distinct and keeled near the base. Sheaths are open, compressed, and smooth, perhaps with a tuft of short hair at the base. The collar is whitish, broad, and smooth. Roots are fibrous and shallow. 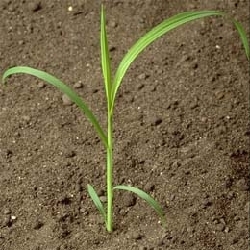 Tillers often form adventitious roots where they touch the soil. Flowering occurs July-September. The seedhead is a coarsely branched green to purplish panicle. 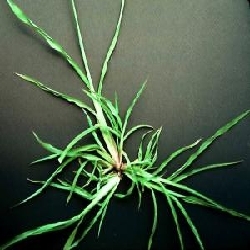 Spikelets are single-seeded, barbed along the nerves, and can have a long terminal awn. Barnyardgrass plants are killed by the first hard frost, but the large thick stems and fan shape of the tillers remain well into winter. Barnyardgrass is very common in irrigated crops and is most often found on moist, rich soils. It is common in both cultivated areas, as well as ditches and waste areas. Johnsongrass seedlings and fall panicum resemble barnyardgrass in the seedling and immature plant stages, but both Johsongrass and fall panicum have a distinct ligule.